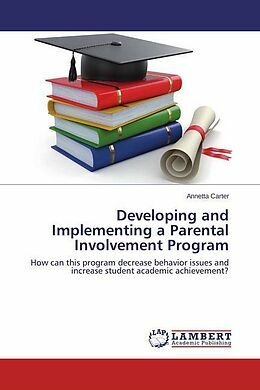 This book engages in a research project that provides an in-depth explanation along with specific reasons of the importance of parents' involvement in their children's education. In reflecting on my past and present experiences as an educator, I have found that students who display behavior problems, lack of motivation toward schoolwork, and disengagement begin to experience academic failure and become social outcasts. I have also observed that these students have very little parental involvement in their education or educational interests. These students are being deprived of the outside support, guidance, and encouragement that come from within the home. It is a proven fact that student success is embedded in parental involvement (Hinkle, 2011). Although a large number parents do not know how to help their children with their education, with guidance and support, they may become increasingly involved in home and school learning activities and find themselves with opportunities to teach, to be models and guides for their children. Annetta Carter acquired her Masters of Arts in Education at the Hamline University, in U.S.A. She is now working as Principal at Saint Peter Claver School. She previously worked as a classroom teacher at Saint Peter Claver School in Saint Paul, Minnesota.Her research interests span across student academic achievement and parent involvement. Sous-titre: How can this program decrease behavior issues and increase student academic achievement?